For several years, Adobe InDesign ( ) has been stealing the spotlight from longtime page-layout front-runner QuarkXPress ( ). So the design community has been looking forward to the release of QuarkXPress 7 to see if Quark could reignite its flagship software. Unfortunately, XPress 7 does not represent a significant leap forward. The new release combines primarily me-too additions with some still-evolving original features that have limited appeal for Quark’s broad base of print designers. Most of QuarkXPress 7’s truly new features target workgroups, making collaboration easier. However, that choice will likely disappoint many rank-and-file designers, especially if they’re at smaller firms that don’t work in large teams. Perhaps version 7’s biggest introduction, job jackets let you specify a large group of attributes—from allowable colors based on the ultimate output device, to permissible text styles. This in effect adds a preflighting feature to QuarkXPress, but the feature is too difficult for the average designer to learn and use. The new job-jacket feature in QuarkXPress 7 lets you specify allowable styles and other attributes by importing them from an approved document. 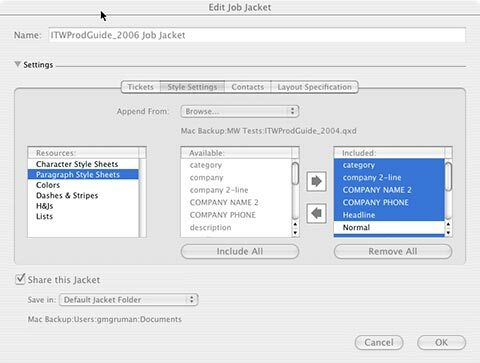 A job jacket is composed of job tickets, and each job ticket contains standards that you can apply to a specific layout. Job tickets define far more attributes than the standard XPress template can hold. For example, a job ticket might include a set of approved colors, style sheets, hyphenation rules (H&J sets), page dimensions, bleed settings, color management profiles, and rules, such as not allowing the use of TrueType fonts. You can then check future documents against this standard for violations. Job tickets can’t restrict designers from defining new styles or using forbidden fonts or colors. But by using a shared job ticket, a production manager can ensure that any changes in the master ticket apply to all documents using it; the master automatically updates all documents and overrides changes contrary to the common styles. Unfortunately, the process of creating job jackets is unintuitive. Quark acknowledges that the feature works best if you have QuarkXPress create a job jacket based on an existing layout, rather than trying to create a job jacket from scratch. But that process is also less than intuitive, because the user interface assumes knowledge of XML data structures. And in fact Quark expects that highly skilled production staff and vendors will likely provide these tickets, often writing them directly in XML—which limits this feature’s use to large organizations with programming-savvy production staff. Once Quark showed me how to create job tickets from existing documents via a complex dialog box sequence, I found it fairly straightforward to create more—but most users won’t get that extra handholding, and the documentation doesn’t go into sufficient detail. I can see the potential value of the job-jackets concept—they can help production staff preflight a document before output, and provide a template file with more information than a standard QuarkXPress template— but the difficulty of creating job tickets makes them less useful for rank and file designers. InDesign-inspired features such as transparency and drop shadows expand creative options, such as the duotone background and drop-shadow logo used here. And the enhanced Measurements palette (bottom) makes it easier to access QuarkXPress 7’s features without delving into dialog boxes. The other major unique new feature in QuarkXPress 7 is the composition zone, which lets you specify an area of a layout that you can use in multiple documents, or that another user can work on simultaneously. Think of it as a frame stored in a separate file that an external user can access and manipulate. This feature reduces the need to move large page files around, but it restricts what each user can do to the separate area. Moreover, some people might find the feature counterintuitive as currently implemented. Whereas it might make sense to simply double-click on a zone to edit it, in fact you have to access that part of the page via the Item menu. And to make a composition zone accessible to other users, you need to use the Layout menu, not the File menu option used to share job jackets. Workgroups in which multiple users edit the same document typically need to track changes, which the composition zone feature does not do. You’ll have to track them manually or use a tool such as QPS (Quark Publishing System). Quark has not announced when it will offer a QPS version that’s compatible with XPress 7. The Table tool from version 5 is still awkwardly implemented as a series of linked boxes, which makes formatting time-consuming. This approach does have some advantages: because each cell is essentially its own box, you can rotate text within each, import pictures, and generally format each one as if it were a separate box. You can also control how text flows from cell to cell using the familiar Link tool. You can now open the same document in multiple windows, making it easier to compare items within your layouts. And the new palettes (right) provide quick access to common functions. QuarkXPress 7 introduces several other features that most users will appreciate. The synchronization introduced in version 6.0 ( ) now manages graphics and shapes, not just text, across a project, so changes to one instance are reflected in all. And XPress 7 now lets you decide whether to synchronize just the content, just the box attributes, or both. This approximates InDesign CS2’s object styles, which allow consistent formatting of objects. If characters are missing from the current font, the new Font Fallback feature substitutes the same characters in a different font on screen. This allows you to see the text, though you’ll still need the missing font to print it correctly. (InDesign just puts a colored rectangle in the place of the missing character.) And you can now align objects relative to the page’s boundaries, not just to the selected items’ boundaries. 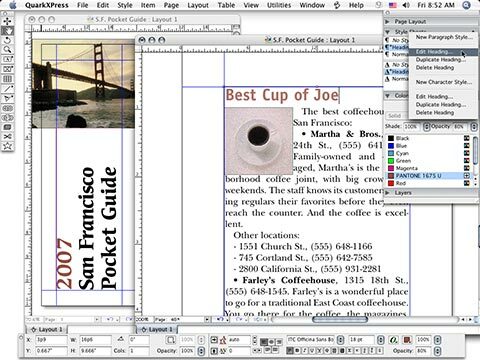 Most of the QuarkXPress 7 additions duplicate capabilities pioneered by its rival, Adobe InDesign. In a few cases, XPress improves upon the original. For example, the central Measurements palette, which provides quick access to a selected object’s attributes, now offers many more controls than in previous versions. As you start working with an object, the palette displays only the controls appropriate to the current selection. This contextual approach lets you avoid using dialog boxes for most of your work—a real time-saver. One nice touch unique to QuarkXPress is the ability to switch modes in the Measurements palette—for instance, from text formatting to frame formatting—without having to change tools first. And the redesigned palette now offers easy access to functions such as drop shadow and tab controls. The new Composition Zone feature makes parts of a layout available for editing by other XPress users. Here, the ad is in its own zone (indicated by the light blue highlighting), so it’s accessible to designers while a writer works on the editorial content. Other InDesign-inspired interface enhancements include color outlines to indicate an object’s layer, the ability to open several windows for the same document (or, in Quark’s case, to create multiple document views as well as multiple document panes), a lock function that lets you lock the attributes and position of objects independently, control over whether picture attributes such as rotation and scaling are maintained when you substitute a new picture (finally! ), the addition of a color-proof preview mode, dockable palettes, and palette sets (analogous to InDesign’s workspaces) for saving different interface configurations. XPress 7 also rectifies some longstanding output omissions: it can now create PDF/X-compliant files, save PDF and other output settings as reusable styles, and embed fonts in EPS files, and it supports Unicode format for symbol consistency as documents traverse platforms and languages. 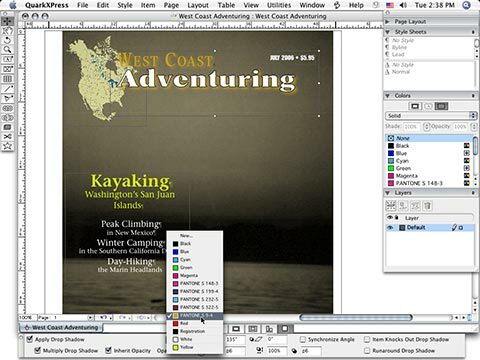 QuarkXPress now matches two ooh-and-aah InDesign features: transparency and drop shadows. Unfortunately, Quark hasn’t provided a preview option in the dialog box so you can view your settings as you experiment; instead, you must click on the Apply button each time you want to see your settings in action. But if you use the Measurements palette to set drop-shadow attributes, QuarkXPress 7 applies the changes live. In the case of transparency (which QuarkXPress calls opacity ), the XPress version is better in some key respects: you can set transparency based on the color swatch applied, so you can have different transparency settings for, say, the fill and outline of a box. (Similarly, you can change the transparency of individual words in a text box.) By contrast, InDesign applies the same transparency setting to the entire object. I do wish Quark had taken the next step, though: it would be nice to be able to include transparency as part of a color swatch setting, so you could apply and change it globally. And I wish QuarkXPress had included blending modes with its transparency feature, à la InDesign and Photoshop. 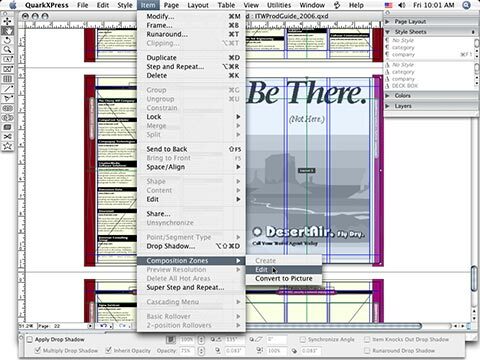 Typographically, QuarkXPress 7 has come up to speed in terms of several key InDesign innovations. XPress now boasts a palette for easy access to special characters, support for OpenType font attributes, a menu option for inserting special spaces, and options to manage ligatures in each paragraph style rather than just globally. But in this area, Quark has missed an opportunity to surpass InDesign: it would have been nice to have the option to update fonts in style sheets—instead, as in InDesign, you still have to go through all your style sheets manually to replace any missing fonts you no longer want to use. And QuarkXPress 7 still can’t convert consecutive hyphens to em dashes. But QuarkXPress still lags behind InDesign in several key areas, including paragraph-based composition, shade styles, based-on master pages (master pages based on other master pages), undo levels, guide management, and optical margin alignment (hanging punctuation). I had hoped that Quark might address some of the limitations that lingered in versions 5 and 6, and it’s disappointing that the company has not taken the opportunity to really push the program forward. 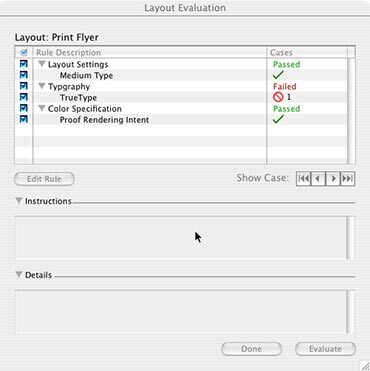 For example, the multiple-layout capability introduced in QuarkXPress 6 still can’t flow text from one layout to another within a project file, nor can it share hyphenation exceptions or layers across layouts. So the feature is really just a way to ensure that multiple documents share the same styles and swatches by putting them in one file. QuarkXPress 7 is disappointingly slow compared to the previous version when I tested it both on Intel and PowerPC Macs. On average, Quark 7 ran about half as fast as version 6.5, and in some tests, the difference was even more dramatic. For example, it took 16 seconds to reflow a 27-page document in XPress7, compared with 4 seconds in XPress 6.5 on a dual-core Mac Mini. On an older G4 Power Mac, those numbers were 20 and 4 seconds, respectively. For reference, the same operation in InDesign CS2 took 4 seconds on both test systems.While the QuarkXPress 7 available today is the PowerPC version, Quark says it will release a universal version that runs natively on Intel Macs as a free download this summer. Quark has added some good features to XPress 7, including Unicode, transparency, drop shadows, improved palette handling, synchronizing objects, composition zones, job jackets, as well as a multitude of smaller but very useful features such as PDF/X support and Font Fallback. And users who stick with Quark XPress will be happy that the company is adopting some of the InDesign features that began turning heads four years ago. But the new territories Quark is staking out—especially composition zones and job jackets—will hardly excite the broad design community, and they’re difficult to learn. I was hoping for a true revitalization of this former innovation powerhouse, and this version just doesn’t fulfill that promise. Editor’s Note: This review was updated at 5:40 p.m. PT on June 12, 2006 to correctly convey that QuarkXPress 7 does allow you to apply a job jacket to an existing document. We have also updated the section on performance slowdown to correct erroneous information supplied by the company. The section on InDesign-inspired interface enhancements was updated to clarify information about the ability to open several windows for the same document.